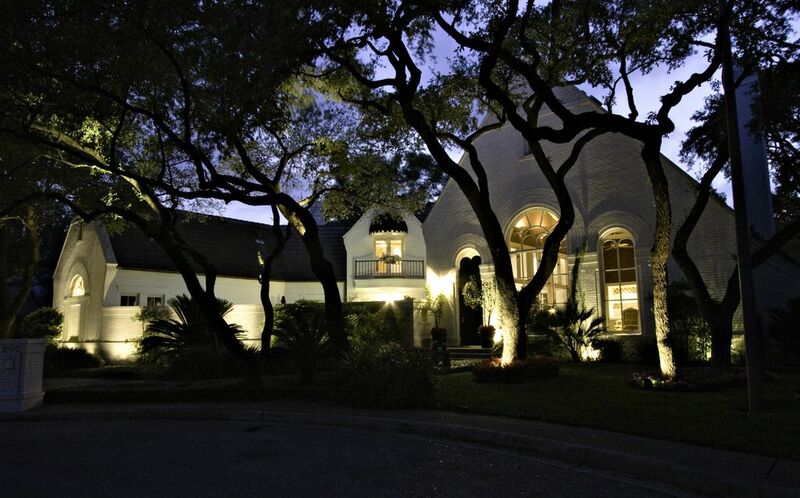 We provide beautiful professional, outdoor lighting for your San Antonio home and landscape. As you peruse the pages of your favorite home or garden magazine you will probably notice the prevalence of tantalizing images that show homes and landscapes with outdoor lighting. You may think that creating that same type of nighttime magic at your home isn’t within your reach. However, nothing could be farther from the truth. Outdoor Lighting Perspectives of San Antonio has opened up a world of possibilities to homeowners with our professional outdoor lighting designs enabling you to not only dream, but live the dream too! When most people think of lighting the outside of their homes, they usually just consider safety and security. Important considerations, however, lighting can be incorporated into an overall landscape plan that also adds to the overall beauty of your property. The lighting of steps, paths and walkways will make the grounds of your property safer; the lighting of the home façade, trees, and outdoor living spaces will add significantly to the aesthetics and make the home more inviting. And there is the obvious benefit of added security by eliminating dark areas of the yard. 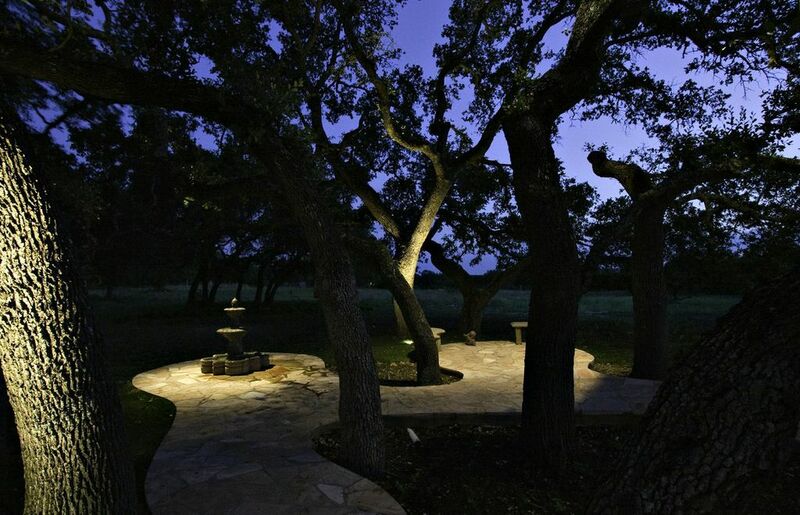 Contact Outdoor Lighting Perspectives of San Antonio and the Hill Country today. Our talented outdoor lighting designers are waiting to assist you too! 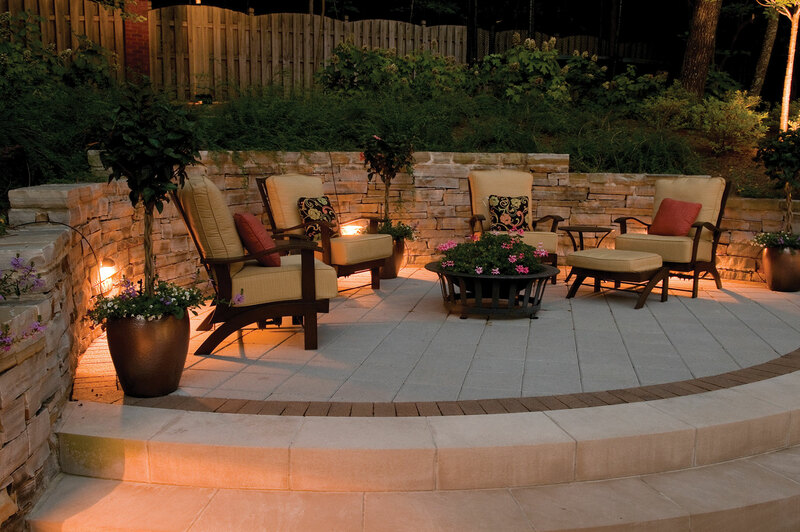 Illuminating your outdoor living spaces can change the way you use your backyard at night! It’s not often that a service or product can totally change the way you feel about an area of your home. Our upscale, elegant outdoor lighting designs can indeed, do just that. Our lighting can transform a once dark and desolate space in the evening and bring it to life and truly change the way you feel and the way you utilize the exterior of your home. If you have ever wished your landscape and outdoor living spaces looked and functioned as they do during the day, we can make it happen. Even though upscale outdoor lighting may seem like a dream that is far out of reach, it isn’t. Outdoor Lighting Perspectives of San Antonio and the Hill Country is the area’s premiere upscale outdoor lighting company. We specialize in turning your outdoors into the space you have always dreamed of; relaxing, functional and memorable in the evening. The benefits of lighting extend past the aesthetically pleasing atmosphere it creates on your property, it can add value to your home and enhance your lifestyle too! Here, we combined landscape and patio outdoor lighting to create a spa-like escape for these homeowners. With the summer outdoor living season underway, we have put together a list of the top 5 outdoor areas that benefit from the addition of outdoor lighting. Outdoor Lighting Perspectives of San Antonio deck lighting. #1) Decks – Decks are the most all- American of all outdoor spaces. Today’s decks range from simple to over the top designs which beg for enhancements such as lighting. Not only will deck lighting create ambiance in your deck space, it will also make it safer to enjoy during the evening. Evening social endeavors such as barbecues and outdoor dinner parties have no curfew or time limits to the good times when outdoor lighting is involved. Our expert lighting designs include stair tread lighting, post and deck rail lighting. We also accentuate the custom features of your deck with specialized lighting such as lighting under bench seating and above grilling and cooking areas. We can finish out your deck lighting by adding landscape and path lighting around the perimeter of your deck to allow easy navigation from the yard to your deck, which also enhances the landscaping around your deck too. #2) Patios – In the same way deck lighting enhances the beauty of your deck, patio lighting does the same. Patios are generally centrally located within the landscape. Patios can be a part of an outdoor living combination area, or placed as a secret refuge within the landscape. No matter where your particular patio is located, we can add lighting that will enhance the function and beauty of your patio and the landscape surrounding it. Outdoor Lighting Perspectives of San Antonio water feature lighting. #3) Pools and outdoor water features – What better way to heighten the senses than light dancing off of tranquil water? Pool and water feature lighting is a must for homeowners who want to get the most out of their pool and underwater space. Our installations include Koi ponds, waterfalls, and fountains as well. Lighting will allow you to enjoy that “midnight swim” with peace of mind, and will also allow extended hours of enjoyment by the pool and in the pool. It will also allow you to take in the beauty and serenity of your water feature against the night sky. 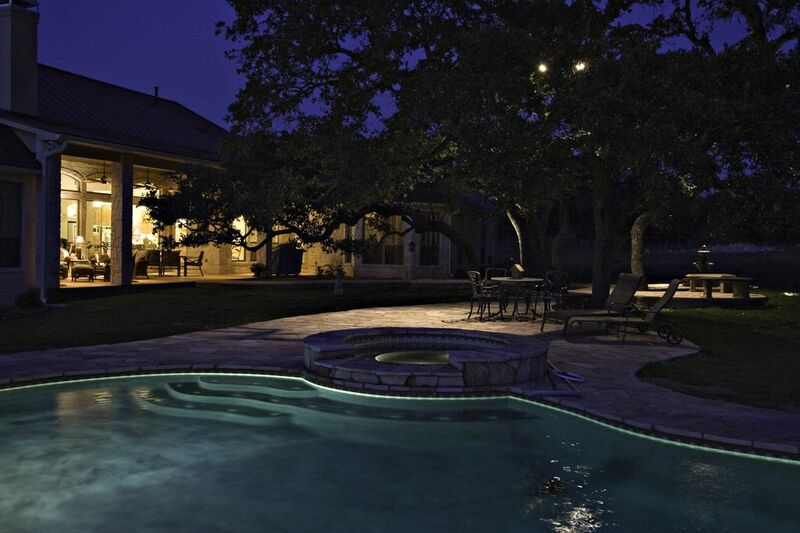 Outdoor Lighting Perspectives of San Antonio and the Hill Country make sure to illuminate the areas around your pool and water feature as well. 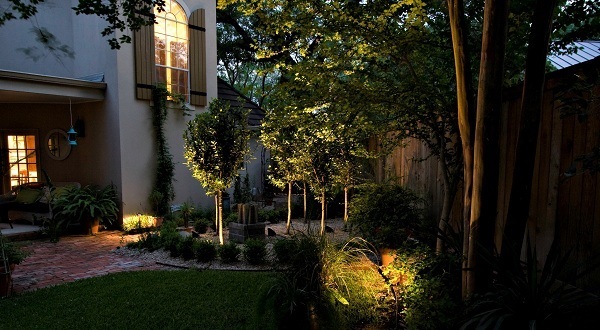 This combination of landscape and romantic lighting create an outdoor oasis setting in your own backyard. Outdoor Lighting Perspectives of San Antonio and the Hill Country patio lighting. #4) Gardens– Our mild temperatures allow homeowners to partake in gardening as a year-round affair, but especially during the late spring and early summer. As temperatures rise blooming perennials are at their peak color and fragrance during this time. What better way to showcase the vibrant colors than by adding garden and landscape lighting to further your garden enjoyment. 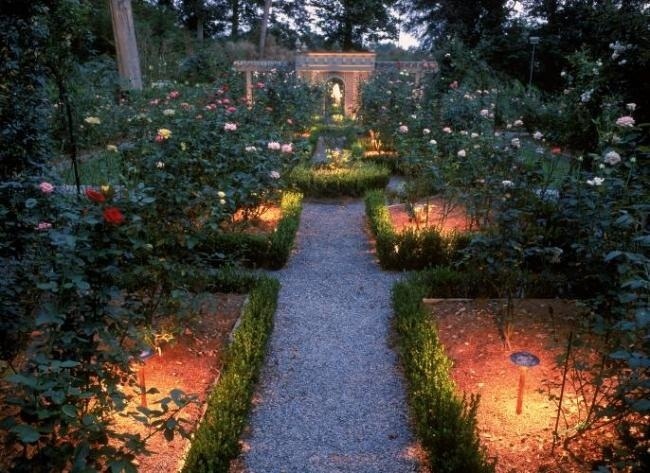 Certain types of plants and flowers will provide even more benefit as they are in full bloom in the evening as opposed to the day; with garden lighting you can enjoy endless splendor in first person as the moment unfolds. #5) Paths and walkways – Outdoor lighting is a wonderful way to make a grand entrance – but, this one is also important for safety’s sake. Trying to travel from your house to your outdoor spaces in the dark is dangerous. Limited visibility and the chance of coming into contact with wildlife such as a snake or fallen branch can present a dangerous scenario when trying to reach your destination in the dark. Path lighting increases visibility and opens up the landscape around it. Gently lit paths that extend from your home to your outdoor oasis destination make utilizing these spaces effortless and worry free any time of the evening. Professional path lighting also delivers a mesmerizing effect within the landscape. The finishing touch to your outdoor oasis! Path lighting permits endless, effortless travel for you and your guests. If you are ready to make this summer the best ever during the time you and your family will spend outdoors contact Outdoor Lighting Perspectives of San Antonio and the Hill Country today. Our outdoor lighting designers are waiting to assist you! Take the plunge and enjoy the season with the addition of outdoor lighting designed to enhance your outdoor living lifestyle. All homeowners are a little bit like kids this time of year. The anticipation of the beginning of summer brings out this quality in even the staunchest personalities. Instead of wishing for ice cream trucks and catching fire flies in jars, adults long for outdoor spaces that can transport them to a state of relaxation. From versatile backyard decks, to poolside areas built to soothe all the senses. There is much to be said about having that one special spot in your landscape that you can enjoy all season long an escape to at the end of a hard day. Imagine that space with the addition of outdoor lighting. Imagine being able to extend the hours you can enjoy your outdoor oasis and all the possibilities adding light would bring. Outdoor Lighting Perspectives of San Antonio urges you to visualize your favorite outdoor space under the romantic illumination of outdoor lighting. With the summer season close at hand, we have compiled a list of the top 5 outdoor spaces that benefit from the addition of outdoor lighting. Deck lighting increases the function and enjoyment of your backyard deck. 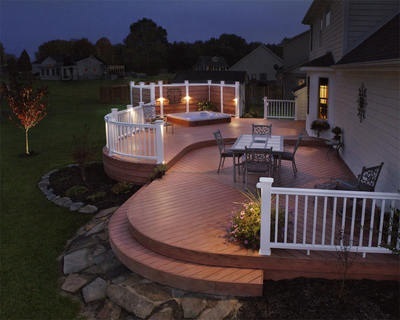 Decks – Decks are the most all American outdoor spaces around. Today’s decks range from simple to over the top designs which beg for enhancements such as lighting. Not only will deck lighting create ambiance in your deck space, it will also make it safer to enjoy during the evening. Evening social endeavors such as barbecues and outdoor dinner parties have no curfew or time limits to the good times when outdoor lighting is involved. Our expert lighting designs include stair tread lighting, post and deck rail lighting. We also accentuate the custom features of your deck with specialized lighting such as lighting under bench seating and above grilling and cooking areas. 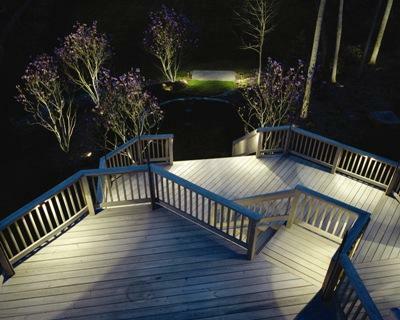 We can finish out your deck lighting by adding landscape and path lighting around the perimeter of your deck to allow easy navigation from the yard to your deck, which also enhances the landscaping around your deck too. This patio is located within the landscape and comes alive with the addition of San Antonio patio lighting. Patios – In the same way deck lighting enhances the beauty of your deck, patio lighting does the same. Patios are generally centrally located within the landscape. Patios can be a part of an outdoor living combination area, or placed as a secret refuge within the landscape. No matter where your particular patio is located, we can add lighting that will enhance the function and beauty of your patio and the landscape surrounding it. Path lighting permits endless, effortless travel to and from locations within your landscape. Paths and walks – This one is important for safety’s sake. Trying to travel from your house to your outdoor spaces in the dark is dangerous. Limited visibility and the chance of coming into contact with a snake or fallen branch can present a dangerous scenario when trying to reach your destination in the dark. 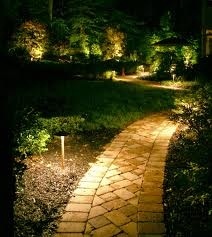 Path lighting increases visibility and opens up the landscape around it. Gently lit paths that extend from your home to your outdoor oasis destination make utilizing these spaces effortless and worry free any time of the evening. Professional path lighting also delivers a mesmerizing effect within the landscape. Outdoor Lighting Perspectives of San Antonio delivers summer lovin outdoor lighting designs to increase the beauty and fun of the season. Pools – What better way to heighten the senses than light dancing off of tranquil water? 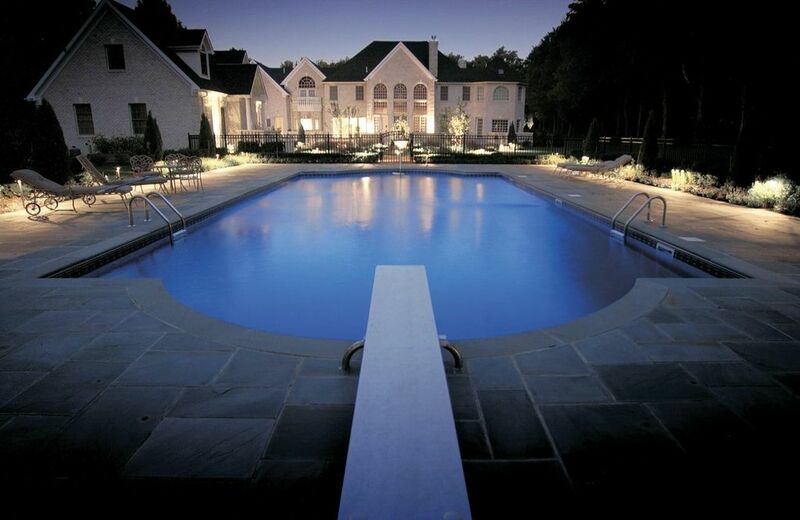 Pool lighting is a must for homeowners who want to get the most out of their pool and underwater space. 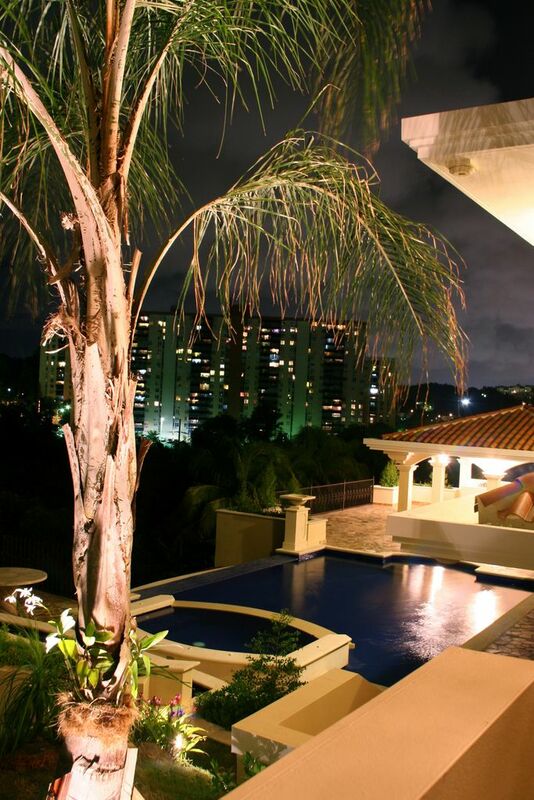 Lighting will allow you to enjoy that “midnight swim” with peace of mind, and will also allow extended hours of enjoyment by the pool and in the pool. Outdoor Lighting Perspectives of San Antonio and the Hill Country make sure to illuminate the areas around your pool as well. 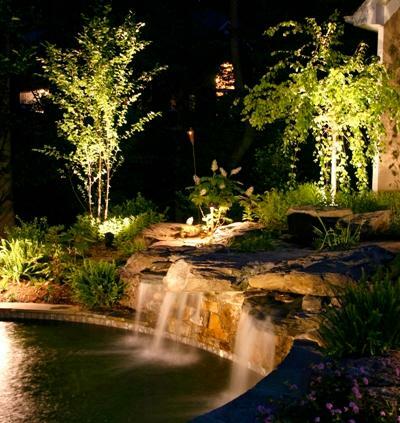 This combination of landscape and pool lighting creates an outdoor oasis setting in your own backyard. Here we combined garden and statuary lighting to provide a secret garden atmosphere for these San Antonio residents. Gardens– Our mild temperatures make gardening a year round affair, but especially during the late spring and early summer. As temperatures rise blooming perennials are at their peak color during this time. What better way to showcase the bold hues and lush greens than by adding garden and landscape lighting to further your garden enjoyment. Certain types of plants and flowers are in full bloom in the evening as opposed to the day; with garden lighting you can enjoy endless splendor in first person. Urban backyards can enjoy the same benefits from our timeless outdoor lighting designs. If you are ready to make this summer the best ever during the time you and your family will spend outdoors contact Outdoor Lighting Perspectives of San Antonio and the Hill Country today. Our outdoor lighting designs will bring out the same amazement and enchantment you found in the outdoors as a kid! Visit our deck and patio lighting photo gallery, our pool and underwater photo gallery and our landscape and garden photo gallery on our website to see more inspiring images of outdoor lighting bliss.